I was rather excited to have an opportunity to review The Shapeshifters. Over the past couple of years, I've read a fair amount of (translated) Nordic fiction, and after watching the movie Trollhunter, I should admit an interest in Nordic mythology concerning trolls! Stefan Spjut's novel does not easily fit a particular genre. It is a lengthy read (close to 600 pages) which seamlessly blends horror, crime and fantasy. Personally I'd like to categorize this as "magic realism", but will be very interested to see what others make of it after the general release in August this year. What I can say for sure is that those who seek an action-packed thrill-ride will likely be disappointed. 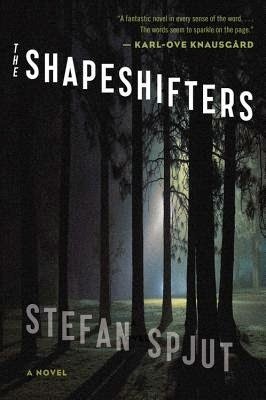 The Shapeshifters is a slow-paced novel: the explorations of realistic, believable characters and Nordic culture play as big a part (if not more) than the presentation of supernatural beings. Some of the early reviews I've read on Goodreads criticise the novel's supposed "padding", suggesting that several passages and short chapters focused on irrelevant details, but I think they have missed the point! For me, these details help create a sense of "realism", presenting characters we can identify with because they purposefully lack superhuman abilities of intelligence, resilience or strength which have become so cliched in more genre-specific titles. However, The Shapeshifters is not flawless. My main niggle with the novel lies in the irregularity of the presentation: it is told through three different viewpoints: those of Susso, Seved, and Gudrun (Susso's mother). Which would be fine if we had some indicator at the beginning of each chapter as to whose viewpoint is narrated to save confusion in reading the first couple of paragraphs. Particularly through Gudrun's chapters, which are narrated in the first person. I also wonder if much of The Shapeshifters' literary value is lost in translation: as an English-speaker I imagine that the meaning of both language and legend presented would have been delivered more successfully in the original Swedish to those of a Nordic background. Overall, I did enjoy reading The Shapeshifters very much. The slow, consistent pace built up tension without becoming dull, and I particularly liked the historical elements of the story which drew from Nordic culture and legend to create a backstory which is both believable and surreal. Having withdrawn only one star for my slight disappointment in form and translation, I'm happy to give The Shapeshifters four out of five stars.